Bus and subway fares will rise from $0.90 to $1.10 and train fares will rise by about 25% across the board. The governemt is hoping to save $800 million on subsidies that it provides. Fares may be increased as soon as this Saturday. Honda Motor Co. said it will put off opening a $100 million car plant in Argentina by about six months, adding its name to the growing number of Japanese auto makers lining up production and job cuts amid falling demand. While Honda had planned to start production at the factory located in the province of Buenos Aires in the second half of this year, it now aims to open it in mid-2010, said a company spokeswoman. Polo tourism in Argentina is up and multi-million dollar polo complexes are under development despite the rest of the world’s financial woes. Another article on the coin shortage in Argentina and a possible, though not likely, solutuion. Cattle-rustling is an age-old problem on Argentina’s legendary Pampas plains, but genetic testing is helping police crack down on thieves. Plans are underway to expand a pioneering database of genetic samples from 10,000 cattle that has helped police solve 270 cases of cattle-rustling since it was established in Buenos Aires province seven years ago. Daniela Cott, 16, is tipped for superstardom after being signed up by the world´s biggest modelling agency Elite. Daniela, who stands 5ft 10ins tall and has emerald green eyes, was spotted two years ago as she sifted through rubbish on the streets of Buenos Aires. Last year Daniela beat 1,000 other hopefuls to win Argentina´s Elite Model Look final. An Italian climber and an Argentine guide both died when a storm trapped five mountaineers just below the summit of Aconcagua, the highest mountain in the Americas. Three other climberss survived. A hot, dry spell in Argentina has damaged corn crops and delayed farmers’ plans to sow soybeans, lowering potential yields. Corn was damaged this week when temperatures soared to more than 93 degrees Fahrenheit and humidity levels plunged. 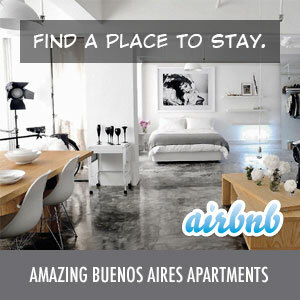 Looking for an apartment in Buenos Aires? Have $5.9 million to spare?